Vallerian Designs - Last additions/Dark blue 11mm potato pearl necklace with stunning Balinese feature bead and clasp with matching earrings. 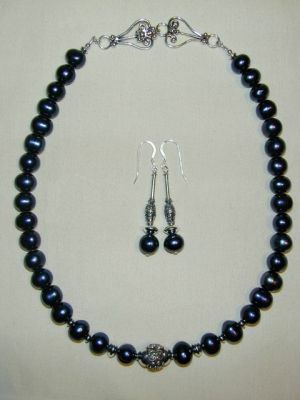 Dark blue 11mm potato pearl necklace with stunning Balinese feature bead and clasp with matching earrings. This is the most stunning pearl necklace I have made to date. The peals are big and have enough impact to carry the beautiful Balinese clasp and feature centre bead. The matching earrings are stunning in their own right.